In the USA today, as climate change brings more extreme conditions of drought, heat and rain, many Americans are dreading a return to the terrible Dustbowl years of the 1930s, which caused the migration and ruin of thousands of small farmers. 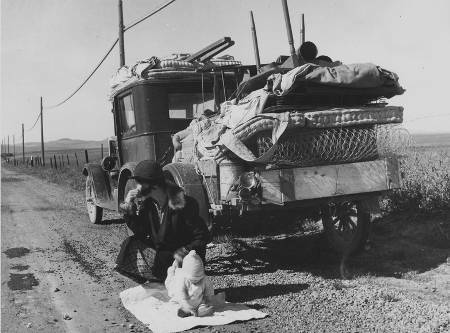 The Dustbowl was a tragic period in American history, an epoch which has best been remembered for future generations by one novelist and one singer. The novelist was John Steinbeck, the singer was Woody Guthrie, the "Dustbowl baladeer"
Woody Guthrie first saw the light of day in the wild dusty oil-boom town of Okemah, Oklahoma, in the year 1912. He was a skinnny curly haired boy who was always quick to smile; but from an early age, the smile hid a background of tragedy and a deep social conscience. And until he died, Woody was to continue making up songs that were full of a love for people, a hatred of injustice, and a happiness in living. Tragedy first struck when Woody was still a young child. His father was a land-trader, and soon made enough money in oil-mad Okemah to build a nice six-room home for the family; yet shortly after the Guthries moved in, the house burned down. By then, the Depression was already beginning to bite, and Pa Guthrie couldn't afford another one. For the next few years, the Guthries moved from house to house as their fortunes got worse; and as if the falling family fortunes weren't enough, human tragedy struck too. Woody's favourite sister, Clara, died after being horribly burned by the explosion of an oil stove. "Later on," wrote Woody in a brief autobiography, "worried from this and other things, my mother's nerve gave way like an overloaded bridge." Not long after, Woody's mother was sent to a mental asylum, where she later died. A saddened and a broken man, Woody's dad did his best to keep happiness alive in the broken family: he would sing to his children, but, remembered Woody, "I could tell by the sounds of his voice that he was not singing to make his own self feel good, but to try and make us kids feel better." Then the family home burned down for the second time. A growing youth by then, Woody set off to seek his fortune far from the sad memories of his childhood. Hitch-hiking across America with a guitar on his back and paintbrushes in his pocket, he made for California, joining the crowds of Okies seeking a better life in the West. He mixed with the migrant farm workers, and learned their trade, singing about it in some of his finest "Dustbowl Ballads"; but Woody was not really a farm laborer. He was an artist and a musician, and he earned a livelihood painting signs, and — most importantly — singing and talking on radio stations. Very soon, he got a reputation as an outspoken defender of the poor and the exploited, and a well-armed enemy of those who exploited them. "I saw the hundreds of thousands of stranded, broke, hungry, idle, miserable people that lined the highways.... I heard these people sing in their jungle camps, and I sang songs I made up for them," he wrote. Soon, Woody was renowned as a militant labor unionist, a champion of the public cause against private greed. In 1941, he was taken on by the Bonneville Power Administration, a state-run organisation, to help them win public approval for two vast dam projects on the Columbia River. The BPA project was hotly contested by the owners of private power companies, who did not want to lose their monopoly over the electricity supply in the region. Woody's collection of "Columbia River Songs" is a major contribution to the social history of the American West in the 1930s and early 40s, fixing in song and poetry the trials of a generation of rural Americans. In part thanks to Woody, the dams were built. In the 1950s, Woody was one of the many artists and writers to fall victim to the MacCarthyist witch-hunts for supposed "Communists". Publishers gave up publishing his collections, and his most famous songs, such as "This Land is My Land", were presented as "anonymous". Still, MacCarthyism was not able to stop Woody, and he went on singing and writing until, in the late fifties, he became confined to bed in a hospital, an incurable victim of a slowly spreading paralysis. For the last ten years of his life, he lay in bed, a dying hero, forgotten by many but regularly visited by a small band of faithful, many of whom were later to make sure that after his death, Woody would not be forgotten. Many of the great folk-singers of the sixties and seventies were among his admirers. There was, for instance, a young girl called Joan Baez, and a skinny curly-haired youth, rather like the young Woody himself, whose name was Robert Zimmerman. Later on, explaining his own success, Zimmerman never hesitated to express his debt to, and admiration of, Woody Guthrie. Zimmerman was the follower, Guthrie the master. Zimmerman went on to win the Nobel Prize for literature in 2016, so of course, you now realise that Zimmerman wrote and sang, and still sings, under another name .... a certain Bob Dylan. What better way to recall the importance of the Dustbowl Balladeer. There are eight idiomatic prepositional verbs in the text, highlighted in yellow. The eight verbs are repeated below in column A, eight meanings are given in column B. Match the prepositional verbs with their meanings. Hitch-hik___ across America with a guitar on his back and paintbrushes in his pocket, he made for California, join___ the crowds of Okies seek___ a better life in the West. 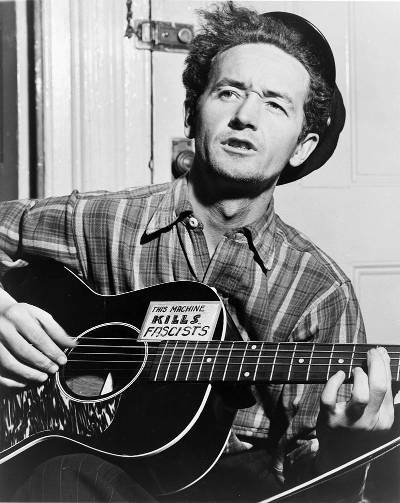 He mix___ with the migr___ farm work___ , and learned their trade, sing___ about it in some of his finest "Dustbowl Ballads"; but Woody was not real___ a farm labor___ . He was an art___ t and a music___ , and he earn___ a livelihood paint___ signs, and — most importantly — sing___ and talk___ on radio stations. Very soon, he got a reputation as an outspok___ defend___ of the poor and the exploit___ , and a well-arm___ enemy of those who exploit___ them. "I saw the hundreds of thousands of strand___ , broke, hungry, idle, miserable people that lined the highways.... I heard these people sing in their jungle camps, and I sang songs I made up for them," he wrote. Soon, Woody was renown___ as a milit___ labor union___ , a champion of the public cause against private greed.